When I set out to write a blog post every day of the 2017 baseball season (183 in total), there was a long list of things I wanted to cover. A player that was at the top of that list was Ted Williams. 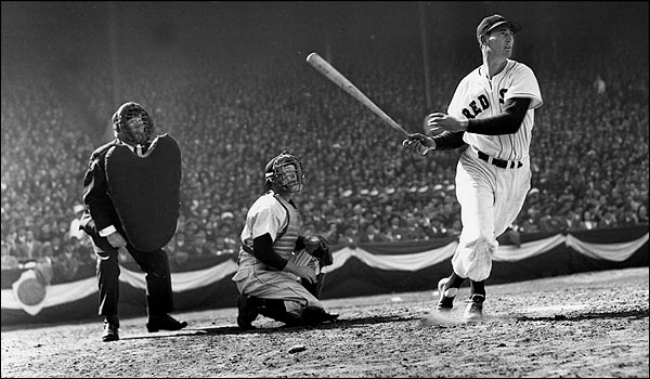 I don't have many days left, so here's my Ted Williams post. Ted Williams is one of the most fascinating people to ever live. Yes, I don't think that's hyperbole. Please read his Wikipedia. His head is still frozen, for goodness sake. Instead of diving deep into his personal life—something we've done before on the podcast—I want to give you my top nine Ted Williams stats. In 19 seasons in baseball, from the ages of 20 to 42, Williams' career slash line was .344/.482/.634. .344/.482/.634!!! His career OBP and SLG marks rank first and second, respectively. Williams compiled 10 .300/.450/.600 seasons, the most of any player except Ruth (11). When Williams retired, his 521 home runs ranked third all-time (behind Ruth and Jimmie Foxx). Williams WAR through his age 23 season (34.2) ranks third all-time, behind Mike Trout (38.1) and Ty Cobb (35.9). Due to his service in World War II, he did not play at all in the prime years of his career from 1943-1945 (ages 24-26). He also missed huge chunks of the 1952 and 1953 seasons for the Korean War. In 1941, Williams hit 37 home runs...and struck out 27 times. In 1950, he hit 28 homers and struck out 21 times. The Red Sox only made the playoffs once in his career (only two teams made it back then). Ted went 5/25 in a seven game World Series loss to the Cardinals. In his final big league at-bat, Williams homered in front of 10,454 fans at Fenway.